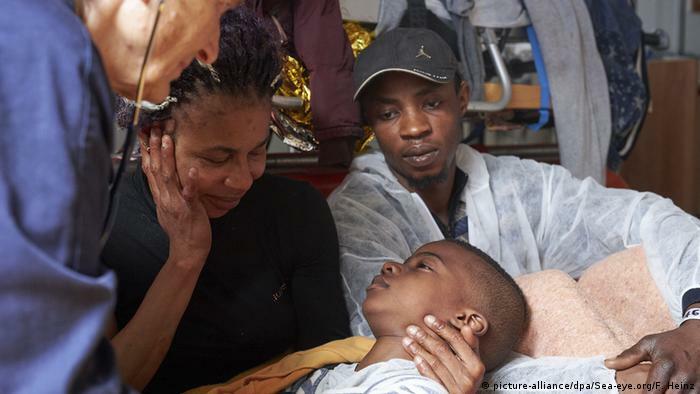 The Sea-Eye, a Germany-based rescue organization, said the migrants aboard the Alan Kurdi vessel have had to endure “unsustainable humanitarian conditions.” Italy and Malta have forbidden the ship to dock in their ports. German migrant NGO Sea-Eye on Sunday called for an urgent solution for its ship stranded on the Mediterranean Sea. The Sea-Eye’s Alan Kurdi vessel is carrying migrants picked up near the Libyan coast. Several EU member states have refused to allow the ship to dock in their waters. “They partly have to sleep outside on deck and are exposed to wind, waves and cold,” Weibl said in Rome. “A storm is approaching, which will put the people on board in great danger,” she added. The ship picked up six migrants off Libya on Wednesday. After Italian authorities refused to take all the migrants, it sailed towards Malta, where it is hoping to enter a safe port. A spokesman for the Maltese government said authorities were monitoring the situation. Malta and Italy have taken in most of the sea migrants in the past few years, but now they have effectively stopped humanitarian aid ships with migrants aboard from docking in their ports. These countries criticize the European Union for not distributing the “refugee burden” equally among member states. “The supplies are quickly used up. We cannot sustain this situation for many days and will quickly need drinking water and food,” said Sea-Eye spokesman Gorden Isler about Alan Kurdi on Saturday.